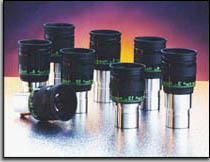 Amateur astronomers have available today a wonderful selection of excellent eyepieces. Much of the credit for that must go to Al Nagler, founder of TeleVue Optics. Al's innovations have opened new worlds for us to enjoy. You might want to check what he has to say about choosing eyepieces on the TeleVue web site. Many of you will have a selection of favorite eyepieces already. Chances are they will work well with the Teleports, especially the 12.5" and 14.5". 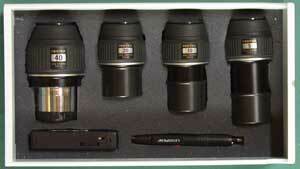 Their larger size and Feathertouch focusers give them the flexibility to handle most eyepieces available today. The 31 mm Nagler in a Paracorr in the 14.5" Teleport gives an awesome low power field with a wide "sweet spot". The Paracorr is also nice in the new 12.5", but less important for it at F/4.84 than for the 14.5," which is an F/4.5. The 7" and 10" Teleports are relatively small scopes, and their built-in eyepiece drawers call for a well-chosen set of eyepieces to fit in with their minimalist size and weight concepts. Ive found it worthwhile have a carefully chosen set in their built-in eyepiece drawers so that when I grab one of them and go, all I need is already there with the scope. Because of the limited space available for their focusers, to keep them from protruding into the light path, the range of travel for the 7" and 10" Teleport focusers is a bit restricted. They may not focus directly with some eyepieces that have focal plane locations far from the norm. I wear glasses and appreciate lots of eye relief. I also prefer an apparent field in the 70 degree or so range for most viewing. Less than that seems narrow, but I find it difficult to effectively use much wider fields. I will make a couple of recommendations based on my own preferences, but you should remember that they are just that. Keep in mind it’s not just the focal length that matters. The field stop diameter determines the true field, a very important consideration. For the 10" Teleport, I really like the new Pentax XW series, which have replaced my earlier favorites, the Pentax XL series. They are a well-integrated, complete set with very desirable characteristics. They are rather uniform in size and weight, all have 20 mm eye relief, and all have a 70 degree field. My favorite 4 piece set is the 40mm, 20mm, 10mm, and 5mm. I often carry the 7mm rather than the 5mm since the seeing in this area is often too poor to allow using the 5mm. The 2 degree + field of the 40mm makes it my finder eyepiece. The 30 and 40 mm in the new XW series is too large for the drawer depth of older 10" Teleports. Those delivered in the summer of 04 or later will have the deeper drawer needed for the 30 and 40 mm XW's. Note that the spacing on the focal lengths in my drawer set is increments of two. A really complete set for serious observing is ideally in steps about half that far apart, or the square root of two. Still, this set of four puts a lot of capability into that small drawer and is very convenient. I put a Teleport adapter on all the 1-1/4" Pentaxes as shown and set them to be accurately parfocal. When I change, I keep looking instead of fiddling. Since the focal length of the new 12.5" is similar to that of the 10", I also like this set for it. Yet it's larger size and Feathertouch focuser allow it to handle most eyepieces available today, including the Nagler "hand grenades." For the 1-1/4" focuser in the 7" Teleport, things are not quite so straightforward. The Pentax series is too large for its drawer, and a bit much overall for such a small scope. I find the TeleVue Radians to be the best set overall for it, but they dont go long enough in focal length to cover the maximum field. For years I bugged Uncle Al for a 24mm Radian. He always said "It’s impossible" to which I always replied "So it will take you a little longer." Instead, he’s now created the 24mm Panoptic, and it’s a real beauty. This great eyepiece is smaller and lighter than the 22 Pan and without that dual barrel I never liked. It has a full 27mm field stop to cover the maximum true field possible in a 1.25" focuser. Team it with three (four if you can squeeze ‘em in) Radians in the 7" Teleport drawer and you have a 22 lb. observatory you can carry in one hand. reqarding what may be best for your observing. for some eyepieces in the Teleports. 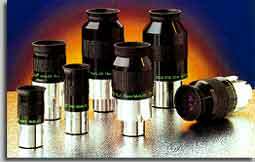 All eyepieces in this series have a 70° apparent field and 20mm eye relief. The 1.25 sizes weigh about 12oz and the 2 sizes (30 and 40mm) about 26oz.